Tudor is no stranger to chronographs, the Tudor Monte Carlo remains one of the hottest auction chronographs to date, the Tudor Heritage Chronograph based on the Monte Carlo is pretty popular as well. That said, Tudor’s modern foray into chronographs really begins with their matte ceramic Fastrider chronograph, beginning as a collaboration between Tudor and Ducati in 2011. But neither of these were in-house calibres, they were either modified 7750s or 2892 calibres with Dubois Depraz modules Given that the last few Baselworld watch fairs saw the introduction of in-house Tudor movements, it was only a matter of time before we saw an in-house Tudor Chronograph. This Baselworld 2017, we sought of got one in came in the form of a Tudor Heritage Black Bay Chronograph. Indeed, the Tudor Heritage Black Bay Chronograph is equipped with a new column-wheel chronograph caliber MT5813, based on the Breitling B01 chronograph, and though it’s not technically in-house, it is exclusive to only two brands and is the result of collaboration with Breitling. To be honest, it’s a mixed bag for this author, the positive is that it’s a proprietary chronograph (and given Tudor’s growing weight and prominence, might wean us off this tendency towards placing too much emphasis on in-house), the not so positive is that you’re wondering how to position this chronograph calibre in terms of provenance, it is more Tudor or more Breitling? Is it 50-50? Which brand’s chronograph is going to offer better comparative value? Whatever your own decision making process is, the Tudor Heritage Black Bay Chronograph offers a robust and reliable in-house chronograph calibre with the brand’s own innovative silicon balance spring (with 28,800 vph), Tudor regulating assortment, 70 hours power reserve and astoundingly (for the price), COSC-certification. 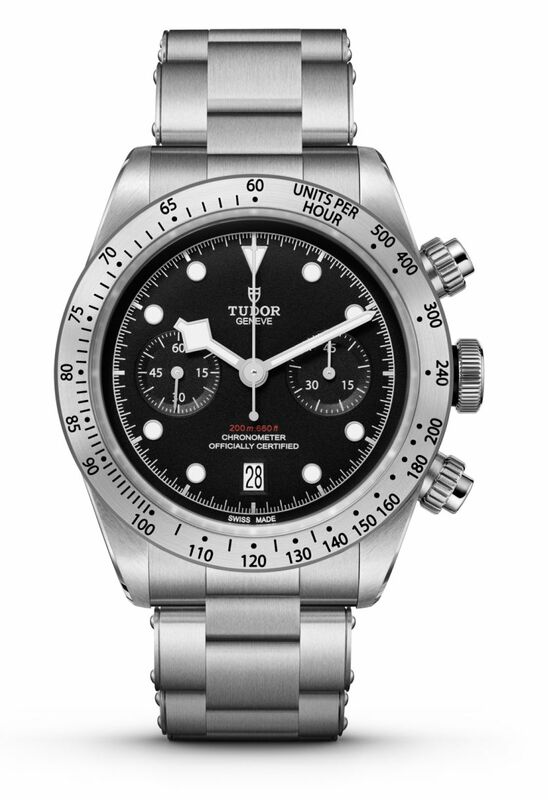 Obviously it uses Tudor’s own oscillating weight with the appropriate brand motifs and I won’t bother going into the finishing – competently industrial, but what I do appreciate the most is the 45 minute counter last seen on the Tudor Monte Carlo, and its subsequent re-make, the Tudor Heritage Chronograph. The 45 minute counter is a brand signature in terms of chronographs where most other bi-compax chronos are content to use a 30 minute counter. 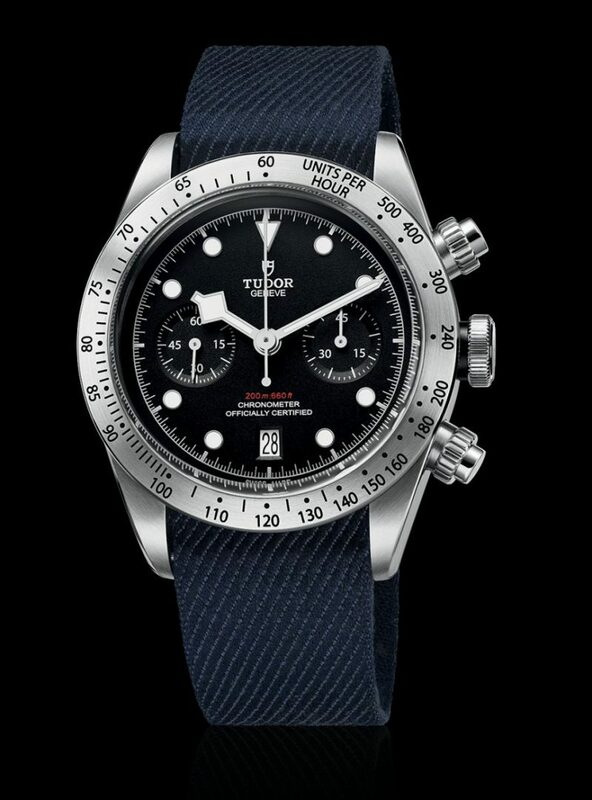 Armed with a column wheel and vertical clutch, the Tudor Heritage Black Bay Chronograph is a hybrid sub-collection given diving history of the Black Bay series and the historical fact that almost all Tudor chronographs have either been tied with motorsports or companies like Ducati who are deeply involved with motorsports. Thus, it’s another mixed bag for collectors to try and place a fairly vintage looking (we’ll get to that in a moment) Tudor chronograph with mixed heritage. 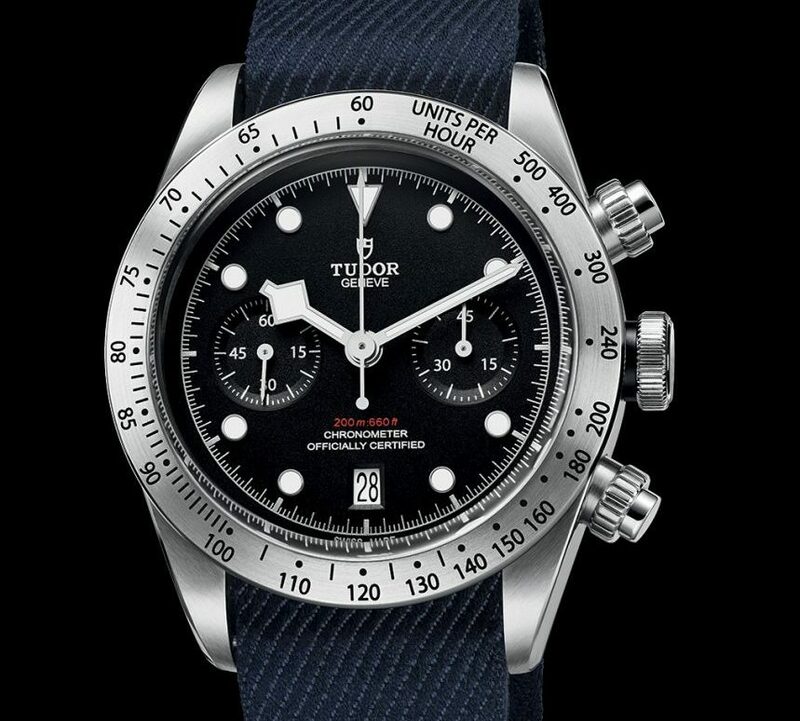 Naturally, there’s no question regarding its attractiveness but inevitably, astute collectors are going to find that the Tudor Heritage Black Bay Chronograph is reminiscent of another chronograph from 1957. That said, it wears its own unique design elements on its dial – faithful to the dial aesthetics of arrow point and dot hour markers and the iconic snowflake hands. The stainless steel case of the Tudor Heritage Black Bay Chronograph enjoys 41mm proportions and while it’s a Black Bay, the tachymetre bezel is fixed rather than rotatable (which would make sense on a diver’s watch but no sense on a racing model). The steel screw-down winding crown, with lacquered black rose motif and black anodised aluminium winding crown tube, together with a combination of Tudor tech grants the chronograph water resistance of up to 200 meters. 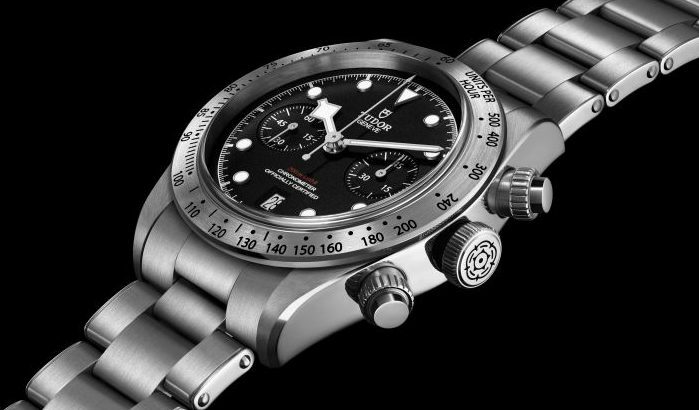 The Tudor Heritage Black Bay Chronograph is expected to become available mid 2017. Retail price for the Black Bay Chronograph with steel bracelet will cost CHF4,800 while the leather strap with deployant clasp will retail for CHF 4,500. Both editions come with additional fabric strap.